Ranching has long been part of Colorado’s rich heritage. Experience the West by gathering at one of the many guest ranches and let time slow down for a few days or several hours as guests unplug from daily schedules and the steady demands of technology. 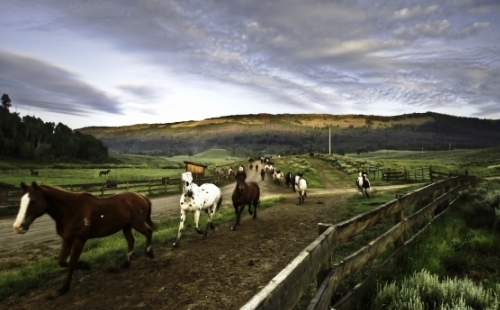 Some ranches have lodging while others serve as premiere venue and activity locations. Full-fledged Colorado dude ranches tend to be all-inclusive during the summer and have different formats other times of year, many offering themed weeks during non-summer months that focus on activities like hunting, fishing, art, cuisine, cattle drives and more. While some are fair-weather only, others transition into snow-related fun like snowmobiling, cross-country skiing, snowshoeing, sledding, sleigh rides and horseback riding in the snow. Not only are ranches optimal for corporate gatherings and incentive trips, they provide outstanding backdrops and built-in atmosphere and activities for wedding parties and family reunions. Rodeo games, horsemanship clinics, pack trips, trail rides, square dancing, helping with chores and gathering around a campfire are just a sampling of typical options. Ranches can be secluded or not too far from the city limits of places like Denver, Colorado Springs, Boulder and Loveland and ski towns like Steamboat Springs, Vail and Crested Butte. Casual and comfortable are the typical modes of operation when gatherings at ranches, but there is plenty of order, too, for business meetings and retreats. Need some team-building prowess? Calf roping, barrel racing, rodeo games and cowboy Olympics are possibilities, with each ranch being unique in its offerings and atmosphere. Accommodations range from comfy to upscale and from cabins to lodges. Tasty fare, often served family style and sometimes made from produce and cattle raised on-premise, feeds hungry crews after a full day of activities and spa treatments can help work out the kinks after a day on the trails. For a memorable Colorado experience, get in touch with this unique and authentic slice of Western paradise.